A new Dark Energy Camera took its first image of the Fornax cluster on September 12, 2012. 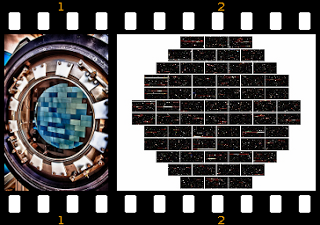 The wide field camera uses 62 separate CCD elements that are sensitive to infrared. The 5-ton cryogenic camera has the largest filter changer ever built. Its wide field images are 570 mega pixels in size. It is mounted on the four meter Blanco telescope located at Cerro Tololo in the high Atacama desert. Astronomers plan is use DECam to photograph 300 million galaxies over five years. Astronomers claim that most of the processes in the universe involve dark energy (an invisible anti-gravity force). Since dark energy is invisible, no camera could actually detect it. Scientists hope that DECam will map the galaxies and so figure out mathematically how invisible matter and energies are affecting the visible universe. According to space-time theories, Earth has an elliptical orbit because it rides the bent rails in the vacuum of space-time. As the vacuum of space-time stretches itself, it also stretches passing light, which is why distant galaxies shine redder than the light from modern atoms. Dark energy is the invisible force that accelerates the expanding vacuum of space-time. Supposedly galaxies are standing still relative to their local vacuums but they are being pushed away at ever increasing speeds as the intergalactic vacuum of space-time stretches out. Cosmologists estimate that 23 % of the universe is dark (invisible) matter. They speculate that 73 % of the universe is dark energy. Supposedly dark energy pulls more energy out of the vacuum of space to accelerate the stretching of the vacuum . Some scientists speculate that only 0.4% of the universe are visible stars. This is why scientists build precision instruments like DECam, to buttress their theories of a universe that by their own admission is more than 99% undetectable. According to Karl Popper, “Once your eyes were thus opened you saw confirmed instances everywhere: the world was full of verifications of the theory. Whatever happened always confirmed it. Thus its truth appeared manifest; and unbelievers were clearly people who did not want to see the manifest truth; who refuse to see it.” Detecting invisible things is not unlike detecting the emperor’s invisible robe, it requires a belief system that is unsupported by visible facts. What belief system? The Bible predicted the scientific faith. In the last days, Peter wrote, mockers will come proclaiming a first law (Greek – arche ktisis) that all things remain the same (2 Peter 3:3 – 6). They will obfuscate the evidence that the plural heavens are out-old (Greek ek palai) with this idea. Western science was historically contrived upon a metaphysical assumption, invented by medieval friars, that the essence of substance is changeless. Scientists defined their concepts of mass, energy and time with this presumption. Their clock-based empiricism, their methods and mathematics were built on the notion that atoms are perpetual motion engines. What is visible in cosmic history only fits the Biblical creation account. First Elohim created (completed action) the plural heavens and the Earth, all of them. At that stage the Earth was without form, not extended in space. Then Elohim’s wind intensely dithered in unbroken continuity over the primordial darkness and continued to command light to continue to be. Evidently that is when matter began to have extension as a relation with light. Indeed, light dithers around within all substances giving them their various properties. Half way through the creation week, Elohim continued to form the Sun, Moon and stars and continued to make them into things that spread, Hebrew raqiya. This is what we observe in the only history that is visible, galactic history. Ancient matter was compressed, not extended in space, and shone at tiny fractions of the frequencies of modern atoms. We observe at many ranges in hundreds of billions of galaxies how the stars continued to spread out from formerly naked galactic nuclei. Billions of galaxies grew into huge, local, growth spirals as the star-stream orbits, the light clocks and the space matter takes up all continued to change relationally. Our ancestors a few thousand years mentioned how the planet used to pass at catastrophic ranges with Earth. Indeed, the Sun’s optical parallax has continued to decrease since the Greek first measured it with angles. It has continued to decrease even since AU (distance to the Sun) was defined canonically with radar and clocks in the 1960s. How could this be? Every clock in the universe is shining at a different frequency from modern clocks. Forty years ago, NASA sent two spin stabilized spacecraft out of the solar system and transmitted radio signals derived from hydrogen maser clocks to them. The spacecraft locked onto the signals, amplified and returned the same signals to Earth. When the atomic clock signals from the past were compared the atomic clocks signals of the present, the clocks were accelerating relative to distance (the past) at approximately the Hubble ratio. Astronomers use the Hubble ratio to estimate the distance to ancient galaxies by comparing their observed light clock-rate with the rate of modern atomic clocks. Karl Popper wrote, “No rational argument will have a rational effect on a man who does not want to adopt a rational attitude.” To invent an invisible universe to support the irrationality of atomic perpetual motion is to demonstrate the blindness of the scientific creed, the one Peter predicted. How great will be the crushing defeat of western science by God’s Word. Where is the evidence? Lift up your eyes and look at visible cosmic history. Don’t be blinded by the scientific creed, with which they invented an invisible universe.